Carnaroli rice differs from the more common Arborio rice used in risottos due to its higher starch content, firmer and longer grain. 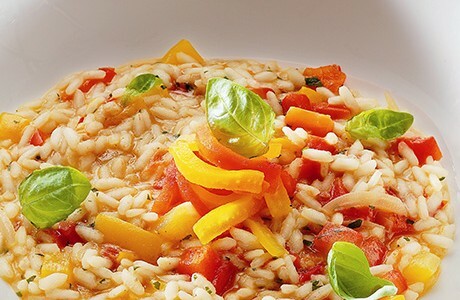 The addition of roasted red and yellow peppers compliments this creamy risotto perfectly. Place the peppers under the grill until the skin blackens. Once ready, place in a bowl, cover with cling film and leave to cool. Once cool peel off the blackened skin, remove the seeds and cut the peppers into small pieces. In a large saucepan lightly fry the chopped onion and celery in a little oil, add the rice and stir, ensuring the rice is coated well and cook for 5 minutes. Add the white wine and let it evaporate, and then slowly add the hot broth a ladleful at a time, stirring continuously. When the risotto is almost cooked add the cut peppers, the peeled, de-seeded chopped tomatoes, the grated parmesan cheese, the shredded basil and the butter. Stir to a creamy consistency. Adjust salt and pepper to taste and serve immediately.